If you had to sum up the appeal of Grosse Pointe Blank, then its dialogue would be a great place to start. This short monologue by Martin to his shrink Dr Oatman about the reunion is a perfect example of just how finely tuned much of this movie is, and also how it doesn’t take itself very seriously (a good idea in a comedy about a hitman developing a conscience): “They all have husbands and wives and children and houses and dogs, and, you know, they’ve all made themselves a part of something and they can talk about what they do. What am I gonna say? “I killed the president of Paraguay with a fork. How’ve you been?” It’s carefully crafted moments like this one – fluid, satirical, and very funny – that ensure the movie has a lightness of touch and doesn’t look and sound like it’s trying too hard. Instead it maintains an even, modest tone throughout, and focuses more on the characters than the action. In Martin Blank, the screenwriters (including Cusack himself) have created a sympathetic hitman whose “moral flexibility” belies a natural charm and wit that make the character more rounded and less stereotypical than usual, so much so that when he does have to kill someone – the corridor fight with LaPoubelle is a highlight – the intensity he displays is borne out of necessity rather than a fundamental flaw in his personality. The only real flaw is that he’s believed himself incapable of living a normal life for all these years. Cusack is terrific in the role, deftly handling the various elements thrown into the mix – drama, comedy, romance, action – and displaying a versatility across genres that had been hinted at before this, but never fully exploited. The cast as a whole are on good form, from Cusack’s sister Joan as Blank’s faithful yet caustic secretary, to Piven’s lovelorn best friend, and Arkin as the therapist who remains unconvinced when Blank reassures him he’s not a target. Even Driver and Aykroyd, acquired tastes unless in the right surroundings, are likeable, and Armitage makes sure that everyone gets enough exposure to warrant them all making an impact. He also directs with a visual flair that’s unexpected, and in conjunction with DoP Jamie Anderson, keeps the movie from settling into a standard action comedy format. It’s a movie that’s full of surprises, touching in places but never too far from another quip or pithy observation, and though it ultimately treads an overly familiar romantic path, there are enough detours along the way to make it feel fresher than most. The action is well handled and expertly choreographed (a little ragged, but in a good way), and there’s a terrific soundtrack from Joe Strummer. All in all, it’s a movie that wants its audience to have a good time, and which achieves that ambition with skill and aplomb, and without having to employ the time honoured process known as shakabuku. 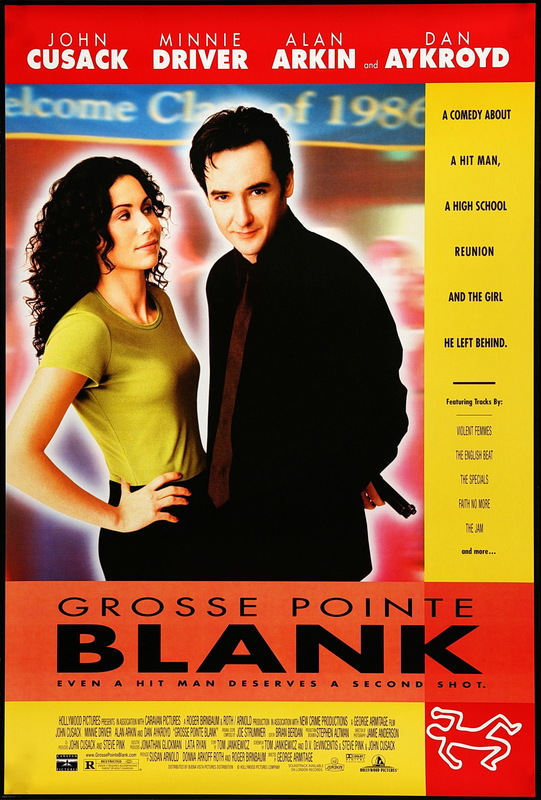 Rating: 8/10 – with various shades of light and dark that allow for differing perspectives on what it means to be a hitman, and a wicked sense of humour that Cusack et al exploit at every given opportunity, Grosse Pointe Blank is an absolute delight from start to finish; still as entertaining now as it was back on first release, it’s a movie that may have dated in terms of the costumes and the hairstyles, but beneath all the horseplay there are universal themes in play to help anchor the frothy, carefree nature of the main storyline, and ensure that the movie resonates with audiences in more ways than one.